The word “foreclosure” is a nightmare for the property owner as well as for the Lender. It happens all the time, regardless which cycle the market is going through, although the numbers do tend to go up during the Real estate bust cycle. Foreclosure is a legal action that a money-lender can take if the person who borrowed money using a mortgage stops paying back that mortgage. 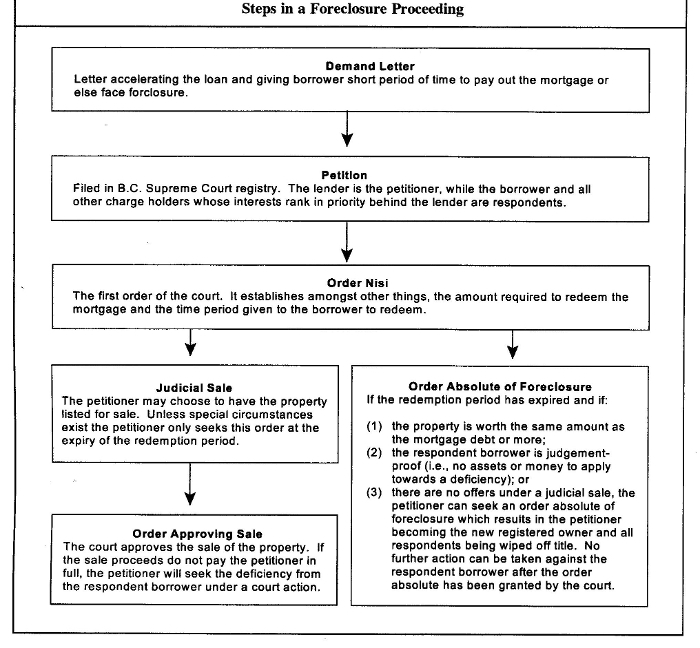 Foreclosure allows the lender to take or sell that person’s house by first getting a Court’s permission to do so. When a property-owner misses a mortgage payment or makes a late payment, the property owner will not automatically lose their property. Lenders don’t want to foreclose if they don’t have to because it is expensive and is a lengthy process. A lender will probably not start to foreclose until two or three months after the borrower has stopped paying. Normally, a lender will first send letters demanding payment. Then, if they don’t receive a reply, the lender will usually start to foreclose and to sue at the same time. The foreclosure process differs from province to province in Canada. a. Allows lender to sell property without the involvement of the court. This particular method was created to keep the recovery process out of the court system and created the ability to make it happen at a much quicker rate than a foreclosure. b. The Process is started by sending a notice to the borrower. Generally speaking, foreclosure is a losing proposition for all the parties concerned. The number of mortgage defaults varies from market to market, and there is no data available to demonstrate the exact figures. In Canada, there are over 1,100 mortgage lenders, approximately. The five major lenders report a 0.26% to 1.0% default rate. When you offer on a regular listing, typically, your REALTOR® will insert several clauses in the offer to purchase that allow you to do your due diligence on the property – inspection, approval for financing, research on the title, etc. When you offer on a foreclosure, in most cases, you’ll need to have your ducks in a row ahead of time – you must write an offer subject only to court approval. This means spending money on an inspection, appraisal if necessary, and getting your bank to approve the financing of the property, all before you have a contract in place. This represents a little bit more risk than a typical sale, because somebody else could offer on it or show up in court after your offer is accepted. So, your REALTOR® prepares the offer, and it is submitted to the lender for consideration. A typical back-and-forth negotation will likely occur, and once consensus is reached, the lender’s lawyer will set a court date for the offer to be approved (typically, 2-3 weeks from acceptance of your offer). I’ll talk about the court process in the next post. The home is “as is”, no warranties. The home may not be in the same conditions as when you saw it. Many upset sellers may return to the home to tear out appliances, cabinets etc., or even cause damage. Foreclosures are big news in the U.S. The real estate crisis is dragging on, and economic problems are keeping the default wheel turning. As a result, foreclosures are becoming a new kind of American dream, one with big winners and big losers; the stuff of exuberant headlines and popular reality TV shows. In the U.S., foreclosure properties can sell for rock-bottom prices. And when we say rock bottom, we mean full houses for the kind of price that wouldn’t even buy a new compact car. Foreclosure is the worst-case scenario in home ownership. Remember that a buyer who has a mortgage is essentially living in a house that’s owned by the mortgage lender; fail to make your payments and the lender has the right to evict you and sell the property to recover what is owed. Of course, homeowners in the U.S. default on their mortgage loans, too, but what happens next is quite different, and determines why foreclosed homes there can be such a bargain for buyers. In the U.S., lenders look to sell foreclosed homes to recoup the outstanding loan on the property. And although foreclosure rules vary from state to state, the key thing to know is that foreclosed homes are often sold at auction to the highest bidder, often for only as much as is outstanding on the loan. The problem is that this amount may be considerably lower than what the house is worth, and essentially hangs the delinquent borrower out to dry. (On rare occasions, the price is higher than what is owed and the lender gets a windfall profit.) Of course, these slashed home prices can be great news for anyone who steps up to buy the property for pennies on the dollar. In Canada, these cut-rate deals just don’t happen. The lender evicts the borrower and is required to sell the property for “fair market value”; furthermore, they must follow certain procedures to prove that they are selling the property for a fair and reasonable price. If the property sells for more than what is owed and the costs involved, then the balance is paid to the borrower/home owner. As such, buyers looking for a good deal may be better off seeking out homes that have been on the market for a long time and trying their luck with desperate sellers. Those sellers have the right to take less. Power of sales can also be good buys, but the lender must take steps to show that the price was fair. A foreclosed property is typically sold “as is, with no warranty or representation” by the lender. For buyers, this means that what you see is what you get. The property may or may not have hidden defects, there are no guarantees of “chattels” like appliances being in the home and they may or may not work when you move in. If there are any encroachments or issues with the land survey of the property, the buyer will generally be fully responsible. Of course, any home can have issues, but in a typical real estate purchase, a buyer is given the opportunity to list these things as conditions in the real estate contract. This puts the seller on the hook for including certain appliances or other items in the sale and ensuring these are in working order, as well as disclosing any serious defects the home may have. Additionally, as part of the purchase, the buyer can check for encroachments, liens and other problems and ensure that the home meets local codes prior to the sale being completed. If any problems cannot be resolved, the buyer can get her deposit back and cancel the deal. In a foreclosure sale, those protections go out the window - which can mean the possibility of additional costs for the buyer. Here’s something foreclosure properties in Canada and the U.S. have in common: they’re often short on fit and finish, and may lack appliances, fixtures and other things you’d expect to be included in a home purchase. This is because homeowners in default are given notice of the foreclosure wheels being put into motion. As a result, they occasionally damage the property and often take everything that can be moved with them when they leave. Furthermore, homeowners who are struggling financially may have fallen behind on a home’s basic upkeep. What this adds up to is “handyman specials” (and these properties aren’t nearly as quaint as the term would suggest). During most foreclosures and power of sales, if the borrower can repay the loan, refinance or in some cases get up to date on payments, they can keep their home. This period can last up to 12 months, though the home can sometimes be listed during this same period. For buyers, this means that if the home’s previous owner can come up with the cash and sweep in before the sale closes, they’ll get their house back – and the new buyer will be left standing at the curb. In the end, it’s quite variable, which means a lot of possible outcomes – many of them impossible to predict. In the U.S., the extra trouble surrounding buying a foreclosed property may be well worth the effort if you walk away with a home for as little as $5,000 (yes, you read that right). The reality is that this just doesn’t happen in Canada. To put it plainly, don’t go out hunting and expecting a deal. You may as well walk on down the street and eye that fixer-upper that’s been sitting on the market just a little too long...a good cleaning and paint can do wonders. More Questions about foreclosures in BC Canada or a particular property? We can answer any additional question, or get you in to see the home. Contact us.